MASSACHUSETTS -- Jerry Marchitelli has until June 4 to fence in his dogs. Marchitelli's two pit bulls prompted cries of protest from neighbors who say the dogs are a menace to the Lakeland Avenue neighborhood where they live. "Where's the justice?" Russell Caron, of 13 Lakeland Ave., said outside Town Hall after the hearing. "They're waiting for somebody to get mauled." Caron and his wife, Joan, are the primary complainants in the case but they are not alone in their concerns. The couple was joined by about a dozen neighbors who voiced fear and frustration with a situation that has lingered for two years, according to Russell Caron. "I was attacked by their dog and my wife was attacked by their dog," he said at the start of testimony about an incident April 13, when the Carons say one of the pit bulls broke free and rushed Joan Caron while she was walking in the neighborhood. Joan Caron is a mail carrier and said her limited training on dealing with vicious dogs on the job helped prevent Marchitelli's pet from badly hurting her. "I was scared to death," she said. Joan Caron said she stood her ground and shouted at the dog to stop, which gave her enough time to call her husband on a cell phone. He ran to her aid with a golf club in hand, she said. "If the dog had taken one more step, we wouldn't be in this situation," Russell Caron said. 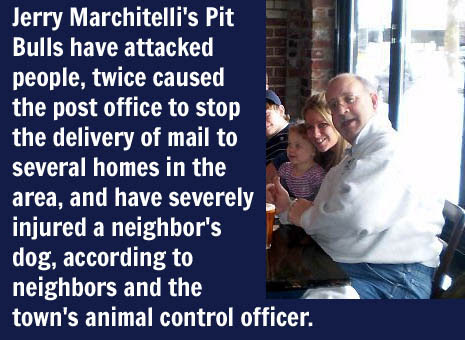 Marchitelli's dogs have attacked people, twice caused the post office to stop the delivery of mail to several homes in the area, and have severely injured a neighbor's dog, according to neighbors and the town's animal control officer, Penny Schiller. Selectmen expressed sympathy with the concerned neighbors, but gave Marchitelli one more chance in a 3-1 vote. "This one is probably one of the hardest ones we've had," Selectman Jerry Sullivan said of the vicious dog complaint. The selectmen voted to require Marchitelli to keep his dogs leashed and restrained, to not allow them outside without supervision, and to spay his female pit bull. Selectmen added a requirement that a 6-foot-high fence be constructed on the property by June 4 and that a double gate be installed so the dogs would not inadvertently escape. If Marchitelli does not comply, selectmen will hold another hearing "to consider additional options to include but not be limited to euthanasia." "You have one chance and one chance only," Sullivan said. "I guarantee if you come before this board again, you will not like what happens." Marchitelli struck a conciliatory tone in his comments to the selectmen. "I don't blame the people," Marchitelli said, when he rose to speak. "We're going to do everything we can to protect our dogs and protect our neighbors." Reached by telephone after the hearing, Marchitelli said he and his wife were discussing what to do next. In the meantime, he said the couple would comply with the selectmen's order. OKLAHOMA -- There's new information about a horse abuse investigation in Tulsa County. The News On 6 spoke with Roberta Christian, the woman accused of mistreating her horses. 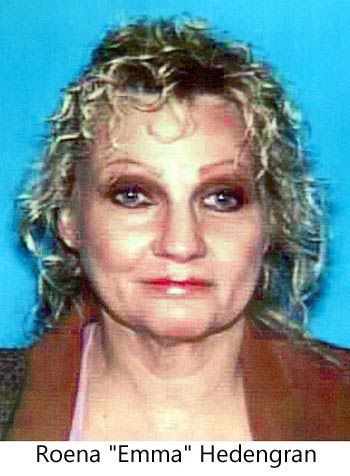 Deputies seized all two dozen horses that she and her husband Darrell Leon Christian own on Wednesday. They also said there was so much manure in some of the stalls that they had to pry the gates open to get the horses out. News On 6 reporter Steve Berg spoke with Christian at the Tulsa County Jail on Thursday. 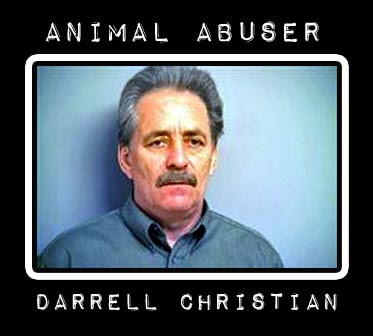 He reports Christian is facing 13 counts of animal cruelty. Roberta Christian told us again, as she did Wednesday night, about the ice storm that damaged her barn. She also told us about financial troubles and trouble with her husband that apparently contributed to her problem. Talking with us in an interview room at the Tulsa County Jail, Christian said the damage to her and her husband's largest, newest barn in January's ice storm was a big factor in the horses' condition. She told us that it "set in motion a huge difficulty of trying to manage (the horses)." But there were apparently problems before that. She says her husband, Darrell, had lost a good paying job in 2001, and was out of work for a year-and-a-half and that his next job didn't pay nearly as well. She also says she believed her husband had made arrangements to move the horses to a different property, since their good barn was damaged. Christian says she learned last month that he had not done that, and she accused him of lying to her. Tulsa County Deputy David Long has had contact with the Christians at the time of the barn collapse and since. And he investigated this case. He says whatever their circumstances, they had better options. "You can sell them, you can give them to rescues, you can foster them, they can go to riding. I mean, there's a lot of things that can be done," Tulsa County Deputy David Long said. Mr. Christian did not want to talk to us on camera on Thursday. Mrs. Christian was actually not aware that he had also been arrested. The main question in the case is why didn't she sell the horses? She said she didn't want to because they were like her children. Abby Hedengran (aka Gert Hedengran, Abby Hedengran, Gert Abby Hedengran). His wife is Emma Hedengran (aka Roena Hedengran, Roena Emma Hedengran). 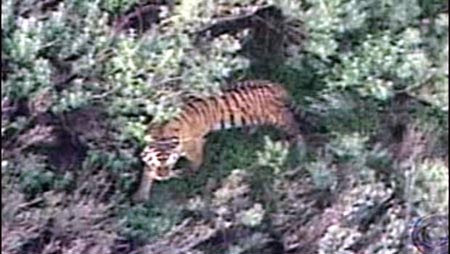 CALIFORNIA -- Gert "Abby" Hedengran, who along with his wife owned an escaped Siberian tiger that was shot and killed in Moorpark in 2005, avoided jail time for his role and instead was sentenced to eight months home detention by a U.S. District Court judge this morning. 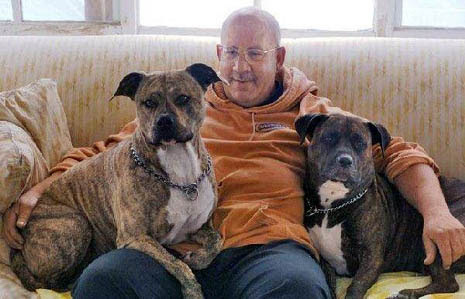 Judge George H. King also sentenced Hedengran, 58, who now lives in Parumph, Nevada, to three years probation and ordered him to pay a $900 fine and $250 special assessment fee, pay for the cost of his home confinement, submit to random inspections of the exotic animals he owns and the facilities they live in and to give a DNA sample. Hedengran's attorney, Kimberly Salvo, said the sentence was appropriate. "I think the judge was fair," she said after the hearing. The judge recognizes Hedengran has done everything he could to ensure this will never happen again, she added. Hedengran had pleaded guilty in January to two felony counts of making false statements to a federal authority and obstruction of justice and witness tampering. He also pleaded guilty to two misdemeanor counts for failing to maintain records of exotic felines. King heeded Salvo's request that Hedengran be spared jail time. The U.S. Attorney's Office had recommended Hedengran be sentenced to 14 months in prison. Standing before King, Salvo argued that her client is 58-years-old, gainfully employed and now has a felony conviction on his record. If he were sent to prison it would make it difficult for him to find meaningful work and Hedengran has worked extensively with officials in Nevada to ensure his exotic animals can't escape, she said. When asked if he wanted to speak on his own behalf, Hedengran, who wore a tie with a tiger on it, said he didn't have much to add but that he took responsibility for his actions. Prosecutor Joseph Johns said he was pleased with the judge's sentence as well. "There is no doubt this was a very serious violation that occurred in the Moorpark community," Johns said after the sentencing. 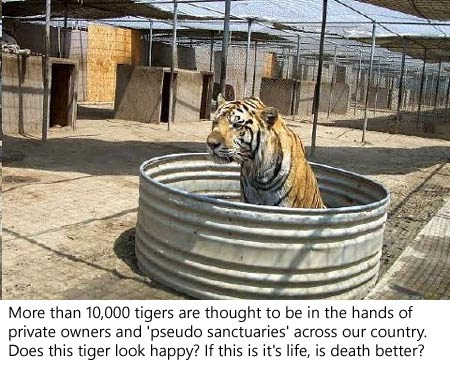 "It doesn't take that much creativity to imagine what could happen with a Siberian tiger lose for four to six weeks in Moorpark." Johns said the home detention Hedengran faces is probably the most serious consequence that had has been handed down against an exotic animal owner in the country. 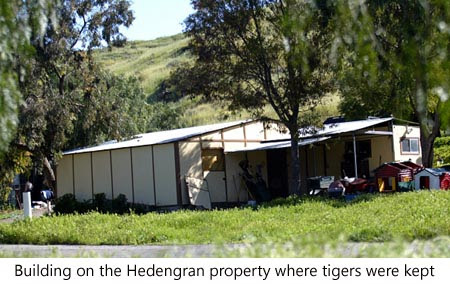 Between Jan. 19 and Feb. 1, 2005, Hedengran and his wife Roena "Emma" Hedengran transported and had others transport about 22 exotic cats, including African lions, Bengal and Siberian tigers and Canadian Lynxs from their licensed facility in Temecula to an unlicensed location in the Tierra Rejada Valley, according to court documents. The couple had lost their U.S. Department of Agriculture exhibitor license because they failed to notify the department of the move within 10 days. 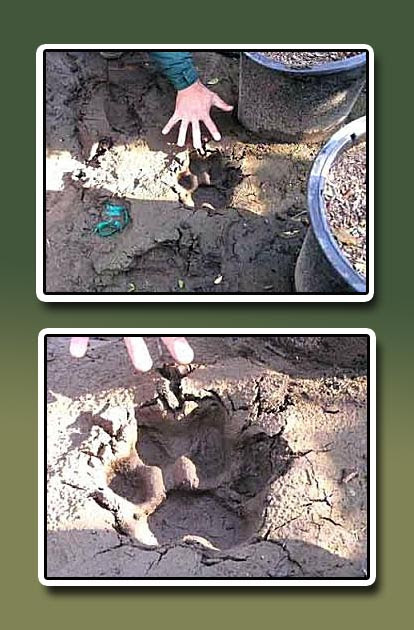 The couple's lynx escaped in January 2005 and after it was found by state game wardens, the property was inspected by USDA officials. 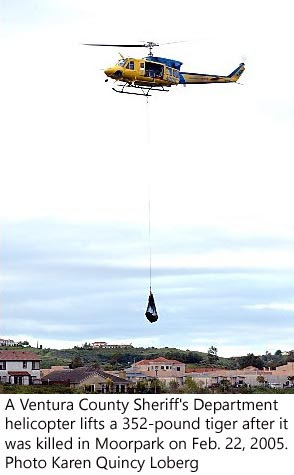 During the inspection, Gert Hedengran said the couple had two tigers, when they actually had three. Gert Hedengran knew that one of the tigers, the one named Tuffy, had escaped and could not be found, court documents state, Hedengran also misled investigators as they searched for the missing tiger, who was eventually spotted in a residential area, shot and killed. Roena "Emma" Hedengran pleaded guilty to one misdemeanor count of failing to maintain records of exotic felines. She will be sentenced on Monday, May 14. CONNECTICUT -- Norman Fortier Jr., who quit as assistant dog warden following a complaint that he had drowned a cat at the dog pound, was charged Thursday with two counts of cruelty to animals. 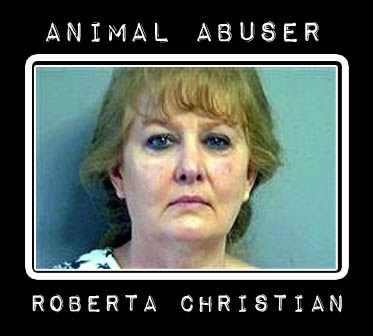 Fortier faces one charge for apparently leaving the badly injured feline to suffer and slowly die at the dog pound, and a second charge for then grabbing the suffering and cat inflicting more suffering and a horrific death by drowning the cat in a bucket after another dog warden had discovered the animal and complained. Fortier, 54, turned himself in at police headquarters Thursday after learning that a warrant had been issued in the case. He was released on a promise to appear in Superior Court on May 14. His phone went unanswered Thursday night. Police officials have said that Fortier's actions violated department policies, and Mayor William Stortz publicly apologized last month for Fortier's actions. Police began an internal investigation after an animal control officer from Plymouth reported seeing Fortier deliberately drown the cat on March 31. Chief John DiVenere said Fortier CLAIMED to investigators that he killed the animal because he thought it was so badly injured that it would not have survived a trip to a veterinarian. Police said Fortier found the injured animal during his work shift on March 31 and concluded that it had been hit by a car. He took the cat to the animal pound on Vincent P. Kelly Road, and apparently drove away to handle a call, police said. An animal control officer from Plymouth, which uses Bristol's pound, discovered the animal. It's unclear how long the cat had been left bleeding and semiconscious at the pound. Police were notified, and a dispatcher sent Fortier to the pound. When Fortier arrived, he drowned the cat in a bucket of water, according to the Plymouth officer. Police commanders put Fortier on administrative leave, and he submitted his resignation just before the start of a disciplinary hearing, according to DiVenere. Fortier had held the full-time job for seven years and was paid about $38,000 a year.